It is time to clear out those old Food and Wine, Saveur, Bon Appétit magazines and folders of articles that I saved over the years. During de-cluttering, I discovered an advertisement on visiting Mexico. The heading reads: “So Delicious it was banned?” Mexico produces wine? Intrigued, I read on…In the 16th century, Mexico produced wine. The wines were so amazing that the King of Spain (name of the King not given; however, my research revealed the King as Charles II; who was an inbred and had mental and physical handicaps. Source: English Monarchs.co.uk) feared that Mexico wines will “force out” Spanish wines. Therefore, King Charles II banned the production and distribution of Mexican wines. The ban was in effect until the 19th century. After Mexico’s Independence War (September 16th), Mexico began producing wine, again. The largest production of wine in the country is exported. The best time to visit Mexico vineyards is in the month of May. Learn about the history of Mexican wine at Vine and Wine Museum in Baja California from the types of crops and grape varieties. 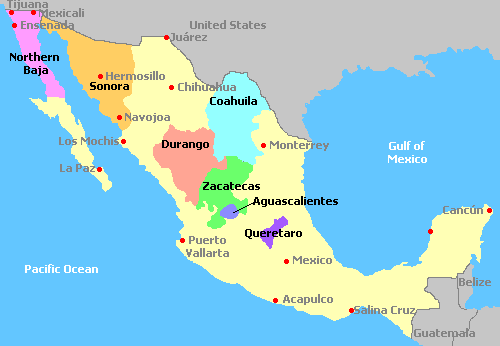 México wine regions: Guanajuato, Baja California, San Luis Potosí, Coahuila and Querétaro. The most notable is Guadalupe Valley in Baja California, located in Northern Mexico. Visitors should start their wine tour in the city of Rosarito. Rosarito is 19 miles from the United States border. Some of the vineyards located in the Guadalupe Valley are Adobe de Guadalupe, Hacienda La Lomita, Las Nubes, Baron Balche, Monte Xanic, Quinta Monasterio, and Vinisterra, to name a few. Wine tasting includes conversations with wine makers, owners and pairing of dishes, some organic. Baja California – Mexico Valle de Guadalupe produces white wines from Sauvignon Blanc, Chardonnay and Viognier. The red wines are as follows: Cabernet Sauvignon, Merlot, Tempranillo, Syrah, Zinfandel, Grenache, Cabernet Franc and Nebbiolo. For more information read “The Mexican Wine Revolution” by Michael Schachner, Wine Enthusiast Magazine, October 2012. Coahuila – Coahuila is a wine-producing región since the 1800s. The first Mexican wine estate is Casa Madero, which was founded in 1597 and still exists today. The first grapes were known as Criolla. The white varieties produced in Coahuila are Chardonnay, Chenin Blanc, Semillon, and Colombard (used to blend with other grapes). The red varieties are Cabernet Sauvignon, Merlot, Syrah, and Tempranillo. Only 25 percent of the grapes grown are used for wine production and eating; 75 percent is used for distilling. Typical wine flavors in this region are sweet and nutty. Sources: Visitmexico.com and mexicanwines.homestead.com. Queretaro – One of the famous wineries in Mexico is known for its production of champagne. Yes folks, México have champagne! Eighty percent of Cava Freixenet de Mexico production is sparkling wine and twenty percent is table wines. The white varieties include: Chardonnay, Sauvignon Blanc, Chenin Blanc… to reds varieties of Malbec, Cabernet Sauvignon, Merlot, Pinot Noir and others (Source: freixenetmexico.com). Other than the name, I did not find any correlation to the Spanish Cava Freixenet. By the way, visitors are only allowed to bring back 1 bottle of wine per person when returning to the United States (source: mexadventure.com). So, drink up and enjoy the wine during your visit.